Christina Duckworth Romer (née Duckworth; born December 25, 1958) is the Class of 1957 Garff B. Wilson Professor of Economics at the University of California, Berkeley and a former chair of the Council of Economic Advisers in the Obama administration. 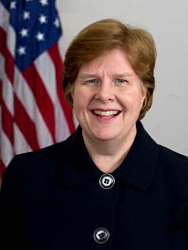 She resigned from her role on the Council of Economic Advisers on September 3, 2010. After her nomination and before the Obama administration took office, Romer worked with economist Jared Bernstein to co-author the administration's plan for recovery from the 2008 recession. In a January 2009 video presentation, she discussed details of the job creation program that the Obama administration submitted to Congress. Romer was born in Alton, Illinois. She graduated from GlenOak High School in Canton, Ohio in June 1977. She obtained her bachelor's degree in economics from The College of William & Mary in 1981, and her Ph.D. from the Massachusetts Institute of Technology in 1985. Her doctoral advisors were Rudi Dornbusch and Peter Temin Upon completion of her doctorate, she started working as an assistant professor at Princeton University. In 1988 she moved to the University of California, Berkeley and was promoted to full professor in 1993. Romer's early work focused on a comparison of macroeconomic volatility before and after World War II. Romer showed that much of what had appeared to be a decrease in volatility was due to better economic data collection, although recessions have become less frequent over time. She has also researched the causes of the Great Depression in the United States and how the US recovered from the depression. Her work showed that the Great Depression occurred more severely in the US than in Europe, and had somewhat different causes than the Great Depression in Europe. Romer showed that New Deal fiscal policy measures, though innovative, were very insufficient, and dwarfed by Hoover's tax increase two years earlier. However, accidental monetary policy played a large role in the US recovery from depression. This monetary policy came first from the devaluation of the dollar in terms of gold in 1933–1934, and later from the flight of European capital to the relatively stable US as war in Europe became more likely. She has done extensive work on fiscal and monetary policy from the Great Depression to the present, using notes from the meetings of the Federal Open Market Committee (FOMC) and the materials prepared by Fed staff to study how the Federal Reserve makes its decisions. Her work suggests that some of the credit for the relatively stable economic growth in the 1950s should lie with good policy made by the Federal Reserve, and that the members of the FOMC could at times have made better decisions by relying more closely on forecasts made by the Fed professional staff. Her recent work (with David Romer) has focused on the impact of tax policy on government and general economic growth. This work looks at the historical record of US tax changes from 1945 to 2007, excluding "endogenous" tax changes made to fight recessions or offset the cost of new government spending. It finds that such "exogenous" tax increases, made for example to reduce inherited budget deficits, reduce economic growth (though by smaller amounts after 1980 than before). Romer and Romer also find "no support for the hypothesis that tax cuts restrain government spending; indeed ... tax cuts may increase spending. The results also indicate that the main effect of tax cuts on the government budget is to induce subsequent legislated tax increases." However, she notes that "Our baseline specification suggests that an exogenous tax increase of one percent of GDP lowers real GDP by roughly three percent." Romer meeting with President Obama and Vice President Biden. She is a former vice president of the American Economic Association, a John Simon Guggenheim Memorial Foundation Fellowship recipient, a fellow of the American Academy of Arts and Sciences, a winner of the Berkeley Distinguished Teaching Award, and a winner of the Council for Economic Education's Visionary Award.. Professor Romer is co-director of the Program in Monetary Economics at the National Bureau of Economic Research, and was a member of the NBER Business Cycle Dating Committee until she resigned from this position on November 25, 2008. In 2008 Romer was set to join the Harvard faculty of economics, while her husband was offered a position at the university's Kennedy School of Government. However, the Romers remained at Berkeley after Drew Gilpin Faust, Harvard's president, vetoed her appointment. Her decision resulted in substantial discussion within the discipline and in the mass media. The motivations for Faust's decision to block Romer's appointment remain unclear, though speculation has focused on an opposition among "New Classical" economists to her "New Keynesian" tendencies, or a reluctance to appoint MIT-trained faculty at Harvard. Today, Romer is a professor at the University of California Berkeley Department of Economics. Romer was approached by the Obama transition team in November 2008 about the position of CEA chair because of her deep knowledge of the Great Depression. In late 2008, along with fellow economic advisors Larry Summers and Peter R. Orszag, she presented then-President-elect Barack Obama with recommendations for a stimulus package. Romer calculated that a $1.8-trillion package was necessary to fill the output gap, but Summers rejected the proposal and opted not to include it in the memo fearing that a trillion-dollar package would not pass through Congress. The Obama administration ultimately passed an $800-billion package. She left the CEA to return to the University of California at Berkeley in September 2010, saying her departure from the Obama administration was timed so that her youngest child could begin high school in Berkeley. In late October 2011, Romer published an editorial in The New York Times calling upon Federal Reserve Chair Ben Bernanke to begin targeting nominal GDP, citing arguments made by economists Greg Mankiw, Robert Hall, and Scott Sumner. She is married to David Romer, her classmate at MIT and her colleague in the economics department at University of California, Berkeley. They have adjoining offices in the department, and collaborate on much of their research. The couple have three children together. She is not related to Paul Romer, the economist famous for his work on endogenous growth theory, although she has a son with the same name. ^ Bohan, Caren (November 24, 2008). "Obama taps Berkeley professor as senior economist". Reuters. ^ "Obama to Tap Berkeley Prof to Chair Council of Economic Advisers". ABC News. November 24, 2008. ^ Calmes, Jackie (5 August 2010). "Top Obama Adviser on Economics to Step Down". The New York Times. ^ "Video: Christina Romer explains a new report about job creation | Change.gov: The Obama-Biden Transition Team". Change.gov. 2009-01-11. Archived from the original on 2011-10-05. Retrieved 2011-09-20. ^ a b "PDS login". library.mit.edu. Retrieved 10 November 2018. ^ "Changes in Business Cycles: Evidence and Explanations" (PDF). Archived from the original (PDF) on 2011-09-27. Retrieved 2011-09-20. ^ Romer, Christina (March 9, 2009). "Lessons from the Great Depression for Economic Recovery in 2009" (PDF): 13 – via eml.berkeley.edu. ^ "Lessons from the Great Depression" (PDF). Retrieved 2011-09-20. ^ "Example of Application of Methodology" (PDF). Archived from the original (PDF) on 2011-09-27. Retrieved 2011-09-20. ^ Christina D. Romer (March 2007). "THE MACROECONOMIC EFFECTS OF TAX CHANGES:ESTIMATES BASED ON A NEW MEASURE OF FISCAL SHOCKS" (PDF). Archived from the original (PDF) on 2010-11-21. Retrieved 25 June 2010. ^ "Visionary Awards: Celebrate with CEE the leaders of Economic Education". ^ "The NBER Monetary Economics Program". www.nber.org. Retrieved 10 November 2018. ^ "Business Cycle Dating Committee, National Bureau of Economic Research". Archived from the original on 2009-03-03. ^ Shan Wang (22 May 2008). "Faust Vetoes Tenure Decision". Retrieved 31 October 2009. ^ David Warsh (15 June 2008). "Old Embers, New Flames". economicprincipals.com. Retrieved 30 April 2009. ^ a b "The $787 Billion Question - Finance & Development, March 2013". www.imf.org. Retrieved 2017-03-06. ^ Lizza, Ryan (January 30, 2012). "The Obama memos". The New Yorker. ^ Scheiber, Noam (February 22, 2012). "The Memo that Larry Summers Didn't Want Obama to See". The New Republic. ^ Romer, Christina (October 29, 2011). "Ben Bernanke Needs a Volcker Moment". The New York Times. Retrieved November 13, 2015. ^ Sumner, Scott (Fall 2011). "Re-Targeting the Fed". National Affairs. Archived from the original on November 12, 2015. Retrieved November 13, 2015. ^ Mankiw, N. Gregory; Hall, Robert (January 1994). "2. Nominal Income Targeting" (PDF). Monetary Policy. University of Chicago Press. Retrieved November 13, 2015. ^ "Faculty Couples Keep Love Alive at Work - The Daily Californian". archive.dailycal.org. Retrieved 2017-03-06. ^ "Berkeley Couple Tackle Top Fiscal Issues of the Day | College of Lett…". archive.is. 2012-07-11. Archived from the original on 2012-07-11. Retrieved 2017-03-06. ^ Rampell, Catherine (2008-11-25). "Christina D. Romer". The New York Times. ISSN 0362-4331. Retrieved 2017-03-06. ^ Pedro, Don (2008-04-26). "... and a few more". Economists for Obama. Retrieved 2017-03-06. Wikimedia Commons has media related to Christina Romer. "Christina Romer collected news and commentary". The New York Times.